The coldest sport on earth is icing global warming. The National Hockey League is skating towards a better future with Thursday's announcement of its Green Initiative in partnership with the Natural Resources Defense Council (NRDC). The NHL has launched a green micro-site within NHL.com called NHL Green. The site contains features, headline news, eco-friendly advice, environmental links and multimedia content. "Our game originated on frozen ponds," NHL Commissioner Gary Bettman said. "Most of our players learned to skate on outdoor rinks. For that magnificent tradition to continue through future generations, we need winter weather -- and, as a league, we are uniquely positioned to promote that message. We are thrilled to be able to work with the Natural Resources Defense Council and to draw upon its vast experience and expertise in greening League events and League and Club operations." The NHL also announced that it will be replacing 30,000 plastic shopping bags with reusable bags at this year's Stanley Cup Finals. "Lakes are freezing later and melting earlier, which is not good for ice hockey, and biodiversity is being lost at historically unprecedented rates, which is not good for the health and well-being of our planet," said Dr. Allen Hershkowitz, Senior Scientist, NRDC. 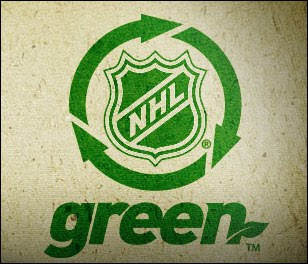 "As one of the world's most iconic professional sports leagues, the NHL should be applauded for launching a program to help address these global environmental pressures, and NRDC is proud to join with the NHL to help identify ecologically meaningful, achievable goals. The NHL has an opportunity to make a real difference in its own operations, with its suppliers, and also to set a standard for others to follow. We are excited to embark on this valuable project." This is a smart move by Gary Bettman and the National Hockey League. If we are going to change the public's perception of climate change then professional sports will hopefully lead the way. Spectator sports provide one of the few public spaces that unites Americans of all stripes and persuasions. When the NHL, MLB, NBA, NFL and MLS take the lead in acknowledging and taking action against climate change, then the skeptical masses will follow. Six Ways the NFL is Greening Super Bowl XLIV. Really.